Radiant Jazz Art Deco cufflink. The imagination and creativity of the cufflink makers of the late 19th and early 20th century is undoubted. A quick scan of the Antique Cufflink Gallery is all that is needed to confirm. What may be lesser known is that the same level of inventiveness and artistry is often evident in the linkages devised to hold the fronts and backs of the cufflinks together. A hundred years ago cufflinks makers wrestled with two challenges: to create cufflinks that could be easily put on a cuff and that would also remain safely in place when worn. The inventive spirit of the age was brought to bear on this issue and a great variety of linkage designs and mechanisms was created. 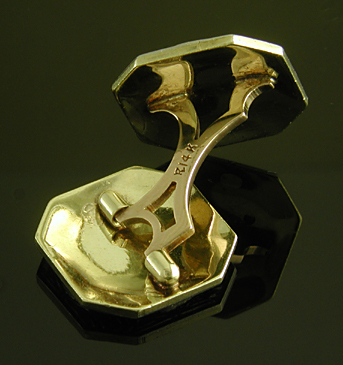 The striking Art Deco cufflink pictured offers an interesting example of linkage design. It was created around 1925 by the Richardson Manufacturing Co. 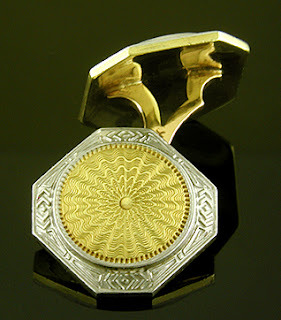 Reverse of Art Deco cufflink. The linkage features a dramatically cut-out bridge that is hinged at one end and rigidly attached at the other. The hinged end allows the top of the cufflink to lie flush against the bridge as it passes through a button hole and the rigid end serves as a "push plate" allowing the wearer's thumb to help ease the cufflink through the cuff. As more angular, sometimes geometrically complex cufflinks came into fashion during the Art Deco era a little encouragement of the cufflink through the cuff was sometimes needed. Once the front of the cufflink passed through the button hole, the top opened and lay flat against the cuff securely anchoring the cufflink in place. The design is both functional and aesthetically pleasing. The same careful thought that was applied to the design and crafting of the finely decorated tops was also applied to the linkages. Recent additions to the Antique Cufflink Gallery include a colorful rainbow of opal, amethyst, jade and heliotrope cufflinks along with a classic button-style tuxedo set from Carrington & Company. In the Antique Brooch Gallery a stunning Art Nouveau amethyst brooch by Whiteside & Blank and a Hans Brassler coral brooch have been added. Recent additions to the Antique Cufflink Gallery include striking purple enamel and pearl cufflinks by Carrington & Co. and elegant moss agate links by Larter & Sons. In the Antique Stickpin Gallery there is Atlas supporting the weight of the world, a fiery Art Nouveau chimera by Carter, Howe and a fierce lion clutching a diamond. Recent additions to the Antique Cufflink Gallery include elegant dress sets by Carrington, a pair of elegantly opulent cufflinks from the Gilded Age and several finely crafted cufflinks from the 1920s. In the Antique Stickpin Gallery we feature swooping bats, ancient columns and a trilogy of stickpins set with beautiful gemstones. Ancient Architecture Diminutive ruins of the classical world rendered in gold and accented with a luminous pearl and three ember-like rubies. A finely crafted architectural stickpin created by Riker Bros. in 14kt gold, circa 1900. Citrine and Scrolls A finely cut citrine with rich golden honey tones glows like a smoldering ember amid fluid, twisting scrolls. This striking stickpin was created by Hans Brassler in 14kt gold, circa 1910. Labels: Alling and Company, amethyst, Carrington, citrine, coral, Hans Brassler, Jacob Hookaylo, Riker Bros. Recent additions to the Antique Cufflink Gallery include several elegant Carrington Tuxedo Sets and striking Art Deco cufflinks with intricately engraved designs by Kohn & Co. and Jacob Hookaylo. In the Antique Stickpin Gallery a mesmerizing Hans Brassler jade stickpin and bright sapphire-and-diamond stickpin have been added. Wishing everyone the very best and good fortune in the New Year! To help celebrate 2018 we have added several elegant jewels to the Antique and Estate Jewelry Galleries. Recent additions to the Antique Cufflink Gallery include roses and diamonds by Larter & Sons, as well as a Japanese garden. Striking platinum and gold cufflinks by Durand & Company, trophies for the victor by Huger and classically elegant cufflinks by Whiteside & Blank. The Japanese Garden An alluring tangle of wild chrysanthemums, leaves and sinuous vines with untamed tendrils curling upwards like drifting wisps of smoke. Elegantly crafted in 14kt gold about 1920. 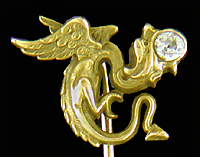 In the Antique Stickpin Gallery two fierce winged creatures by Carrington and Whiteside & Blank have come to rest. Joining the fiery chimera are lotus blossoms by Carter, Howe and an Art Nouveau fantasy that appears to be a leaping alien. New in the Antique Brooch Gallery is a Hans Brassler brooch with golden roses framing luminous pearls and a lambent golden citrine. Recent additions to the Antique Cufflink Gallery include elegant Art Deco cufflinks set with sapphires and diamonds and a Carter dress set with smoky mother-of-pearl. In the Antique Stickpin Gallery we have added an elegant tourmaline stickpin by Hans Brassler and a striking lapis lazuli stickpin by Hayden Wheeler. 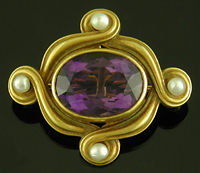 In the Antique Brooch Gallery we added an elegant Art Deco amethyst brooch. Recent additions to the Antique Cufflink Gallery include elegant Victorian cufflinks set with sapphires, fierce Krementz lions, striking agate cufflinks by George O. Street and bright gold cufflinks with an "S" monogram. Sapphires and Scrolls Late Victorian cufflinks with elegant foliate scrolls surrounding deep blue sapphires set in the raised gold centers. The depth and fine details of the scroll work is a testament to the artistry and craftsmanship of the era. Created in 14kt gold, circa 1890. To complement the above cufflinks we have added a Hans Brassler peridot stickpin in the Antique Stickpin Gallery and a small garnet and pearl brooch by the same maker in the Antique Brooch Gallery.